It's not just a hippy EDM thing in the desert. We know what you’re thinking: How can an annual gathering of Waterworld extras in the Californian desert be for me? But there’s a lot more to Burning Man than meets the eye, writes seasoned “Burner” SIMONE UBALDI. The sun, a swollen ball of gas, hangs low over the purple mountains, over the white dust desert. Heavy, huge and muted, the orb glows orange and we stare into its heart, our souls sandblasted by the epic beauty of the universe. There we sit, in the dust, on the bright edge of human experience. In the middle distance, some dude twirls firesticks. I know what it looks like, OK? Burning Man, playground of near-naked Los Angeles yoga instructors gone steam punk for the week. Burning Man, where carnies and circus folk roam free. Burning Man, like Rainbow Serpent, yeah? But in America? Some hippy EDM thing in the harsh Nevada desert. Sort of, yes. Not entirely. I am deeply self-conscious about my love for this event, but I have 100 percent drunk the Kool Aid. Burning Man – arts festival and ground zero for the new world order – is officially my favourite place in the universe. Just let me explain why. Burning Man happens on a prehistoric lakebed in Nevada, a flat, cracked plain that is inhospitable to human life. Fifty-one weeks a year, there’s nothing out there but microbes. 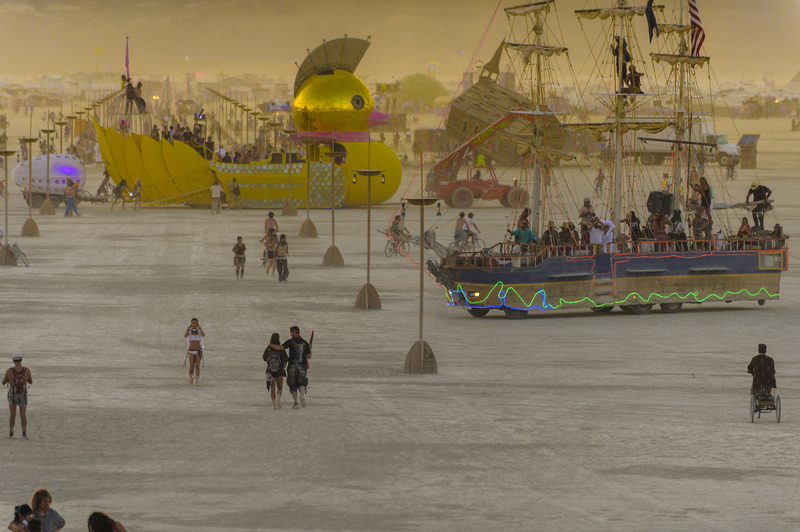 The week of Burning Man, a city appears – Black Rock City – with a population near 70,000. Unlike other festivals, the environment isn’t built by the promoter and served up on a platter, it is built by its participants. From thunderdomes to skate parks to pop-up bars and pancake parlours, the landscape of Burning Man is shaped by a massive, mind-blowing communal effort. The people who attend the festival are the festival, and the more you give, the more you get out of it. Even tourists have to work for the privilege of being at Burning Man, because you can’t buy anything in Black Rock City. You can’t buy water. And without water – in that arid, dust-storming insanity – you could very seriously die. They call it “Radical Self-Reliance”, one of the Ten Principles of Burning Man. It’s like a test, which if you pass it will make you the most smug person on the planet. Black Rock City is built in a semi-circular formation around a central plain know as “the playa”. Beyond the circumference of the circle is the “deep playa”, a vast swathe of desert stretching out to near infinity. On the downside, Burners use the word “playa” without irony. On the upside, the playa is the most glorious, alien dreamscape the hive mind could dream up. By day, it is a treasure map of objects and curios, lost in the desert. By night, it is a shimmering sea of fire sculpture – bodies and bicycles adorned in Glo-wire, cars and trucks transformed into mobile sharks, pirate ships and Death Stars. There are no words to describe the spectacle – no words for the scale. It is Mad Max, it’s Vegas, it’s Disneyland, it’s Mars. Whatever you’re currently imagining is wrong. What you do at Burning Man depends on your persuasion. The various major theme camps around Black Rock City offer daily delights including yoga, paint wars, weddings, bar mitzvahs and pagan rituals where everybody lays their hands on a chosen person. There are debates about the end of capitalism. During the day, you can wander around accepting free food, booze, back rubs and body-painting from half the citizens of Black Rock City. Or you can lie low, conserve your batteries, and wait for the bacchanalia of the evening to unfold. At night there is music – DJs primarily – gracing the multiple massive sound stages that line the outer edges of the city. They play in theme camps and on art cars all week long dropping dubstep, house and techno into the dawn. They pop up in the middle of the desert, spinning discs under a giant glowing heart for an accidental audience of 200 people. They pair up, flare up, and disappear, these DJs – an incidental part of what makes Burning Man amazing. I mention them only as an afterthought. In 2014, that afterthought included Diplo, Skrillex, Gaslamp Killer, Carl Cox and the Thievery Corporation. You’re not always going to have this run of luck, but this year I shared my campsite with The Most Interesting People in America. My campmates included a hacker who brought down MySpace, a former war photographer turned champion chess boxer and an entrepreneurial kid with a large agricultural business in Humboldt County. One of my campmates was writing a book about carbon sequestration in soil while another one, a guy who spent the entire festival in a safari hat, is one of Norway’s best-selling comedy authors. He once mercy-killed a deer with his bare hands. My group was carefully curated by our camp leaders, but it’s no accident that these geniuses were at the festival. Burning Man attracts creative people who do amazing things. And if you’re not doing amazing things on the way in, you’ll be inspired as hell on the way out. It’s that West Coast American optimism, it’s like a shot of adrenalin in your arm. In 2014, there was a sculpture on the playa called Embrace, a 72-foot wooden cathedral shaped like two lovers intertwined. It took twelve months and $266,000 to build. It took less than half an hour to burn. Everything is built to burn at this festival (just like it says on the box). It’s the thing that makes Burning Man majestic. The tradition started with a bonfire on the beach, a spiritual “burning off” in the heyday of Reaganite capitalism, which apparently symbolised some kind of Dharmic divestment in useless, material things. Today, it’s like a fever, feeding the rabid crowd. It’s kind of difficult to describe the elation and hysteria that goes with an epic bonfire but there’s something a bit wild and untamed about it. It’s like watching fireworks – but out of control, destructive, nihilistic and infantile. It’s wicked cool no matter how you look at it, but it’s powerful and beautiful as well. On the last night of the festival they burn the Temple, a monolithic structure on the edge of the deep playa. The Temple is different every year, beautiful every year, and every single year it burns to ashes. Burning inside it are pictures, mementos and letters of loss, the pain and suffering of tens of thousand of punters. People cry for obvious reasons – because they’re saying goodbye to their dog or their dad or their cheating ex-wife, but sometimes it’s a bit harder to explain. It’s like everything incredible in the universe is distilled into that moment, and it’s fleeting, and then gradually it’s gone. It takes courage to invest so much in things then burn them to the ground. There’s something meaningful there about life itself, only beautiful because it ends. Convinced? Plan your Burning Man trip. Qantas flies to Las Vegas.